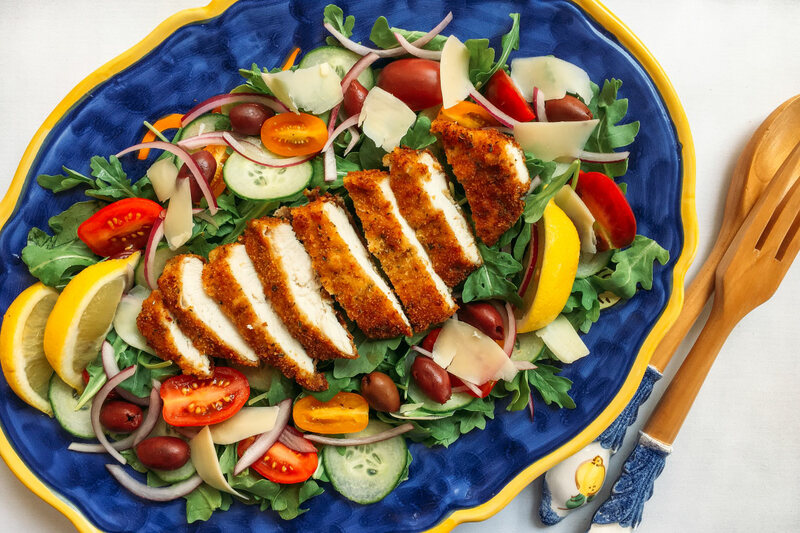 Crispy pan-fried chicken pairs perfectly with a peppery salad for a light yet satisfying lunch or dinner. Breading the chicken cutlets in flour and breadcrumbs results in a super crunchy coating and moist, tender meat. 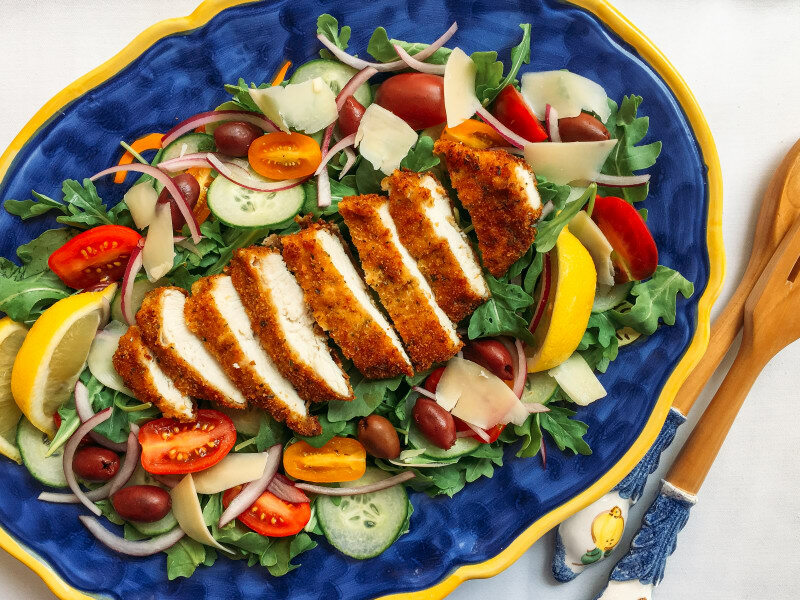 The warm chicken is placed on salad filled with flavors of the Mediterranean: a tasty mix of arugula, fresh cherry tomatoes, sliced cucumber, red onion and Kalamata olives. Large shavings of Parmesan cheese and a squeeze of lemon complete the dish. Serve on individual plates, or family-style on a large platter for a casual dinner party. To make the chicken healthier, bake it instead of frying. Coat with breading as directed in recipe and preheat oven to 375°. Place breaded chicken cutlets on a rimmed baking sheet and bake, turning once, until golden brown and cooked through, 20 to 25 minutes. Per Serving: 1133 calories; 63g fat; 83.9g carbohydrates; 57g protein; 257mg cholesterol; 1321mg sodium. This recipe is much easier to make than it looks! I served this dish over pasta I cooked separately, my family went crazy. Breading chicken like this is really simple and much healthier than frying, which I sometimes do for the crunch. This recipe does not disappoint, enjoy! This chicken milanese recipe was everything I expected and more. I skipped the salad and served it over a pasta. Very delicious and flavorful. I especially liked the bread crumbs. such a delicious dish! perfect over a bed of arugula and spinach. we always serve this family style.